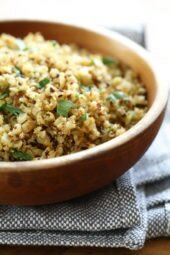 Coconut milk, brown rice, coconut flakes, fresh ginger and cilantro are combined to create this simple side dish, perfect to accompany many Thai dishes. The flavor of the coconut milk is subtle, and pairs perfectly with Sweet and Fiery Pork Tenderloin with Mango Salsa, Tilapia with Coconut Curry Sauce, Thai green coconut curry shrimp, to name a few. The photo above is the rice topped with the mango salsa from the Sweet and Fiery Pork. You can also make this with white rice, which is usually my husband’s preference. For a healthier option, stick with brown rice. I’ve played around with several brown rice varieties and Jasmine works best (I was out so I used short grain). If using white, reduce the water to 1 cup and reduce the cooking time. If you wish, you can add a touch of sesame oil which I often like to do. The flaked coconut is optional but I like the subtle sweetness it adds to the dish. Reduce heat to low, cover and simmer until all liquid evaporates, about 40-45 minutes. Remove from heat, keep covered for 10 more minutes. Fluff with a fork; toss with cilantro. So, on your recipes, are Smart points the same as freestyle points? Or how do we convert them? I apologize in advance if this has been answered multiple times elsewhere. I can’t find the answer. Hi, Gina! Thinking of making this for a dinner party tonight. Have you ever done it in the Instant Pot? Was just wondering if it would take the same amount of time as regular brown rice or whether having the coconut milk in there changing the timing somehow (I am relatively new to the IP and still figuring those timing issues out)? Thank you! I haven’t had a chance to try it in the IP yet, let me know if you do! Mine is cooking right now and I can't wait! I added a handful of dried currents instead of the flaked coconut. Made this tonight and it it's wonderful! It's very aromatic and has a wonderful texture. I added a dash of ground cardamom before cooking, because I serverd it with your Skinny Chicken Tikka Masala. My can of Lite Coconut Milk contained 1-3/4 Cups. I increased the Brown Basamati Rice to 1-1/4 cups and also increased the Coconut milk to 1 1/4 cups. That left me with 1/2 cup coconut milk to use in the Tikka Masala in place of the cow's milk. I just did that to use the remainder of the coconut milk. Try both recipes – they are a delight and your house will smell wonderful! The flavor of this was delicious but my rice came out mushy 🙁 I make rice all the time and have never had this problem…I even tried cooking for an extra 10ish minutes to let all liquid absorb and it was still like mush…the fiery pork was amazing though 🙂 any suggestions as to what i could have done wrong? Made this tonight with your Blackened Salmon and Mango Salsa. I made it with quinoa instead. To answer the other posts on tips for using quinoa, I reduced the water to 1 c. instead of 1 1/4 c. because in my experience, quinoa tends to get a little mushy if you have too much water. It was still a very thick concoction, the quinoa wasn't as fluffy as when you make it with just water, but we all liked it. I made this last night and it was such a hit! I'm making it again for some friends tonight. Thank you for sharing! Do you cook this differently if you use quinoa instead? I am terrible at making rice. I don't know whats wrong with me. I made a cup of rice and it was garbage. So I remade quickly with Quinoa. My guests loved it. I made with the pork Fiery Sweet Tenderloin and it was a great meal! Could i just make this with the coconut milk and water???? Would it be too bland?? HELP PLEASE! I'm making this tonight! I want to make again but my first attempt came out mushy. What can I do different? This was yummy, and smells great – I only had a teaspoon myself, but my 3 year old at a bowl of it, along with your curry shrimp recipe. Thanks! this was delicious. i skipped the grated coconut and added fresh lime juice – great recipe! Wow–ww friendly arroz de coco! Can't wait to try this as all we eat is arroz de coco as we're also Colombian! I also made this with the sweet and fiery pork. I used Jasmine rice. In order for it not to be pasty you need to use 1 cup of water or let it absorb all of the liquid. It took about 35 min for mine to turn out okay. You may need to let it simmer longer…? I'm glad you all liked this. I always keep my Ginger in the freezer. I actually grate it frozen. It lasts longer!! This looks really delicious! I bet it would be great with quinoa as well!I have some coconut milk in my pantry. Might need to be making this! Can this be baked? As in your baked rice n peas recipe? Any way we can get a more accurate serving size? loved it, husband loved it, perfect with the sweet and fiery pork! we've been looking for a coconut rice dish and it is wonderful that it uses brown rice. Going to try this out tonight – looks delicious and excited for a new way to eat brown rice. Made this last night and it was delicious!!! I love coconut! I used unsweeted coconut and it lowered the points a little. I have everything to make this thanks! This looks great, I've never really made the swap to brown rice successfully, but now I think I might be converted, your site has changed my life.. I can actually see my goal approaching this year, thanks to you, now i can actually cook nice foods and eat them..
THAT IS ABSOLUTELY GORGEOUS!!! If only I had some coconut milk. Can any other milk work? Hi! I'm a new follower, and this sounds great! I will have to add it to my list of new stuff to make. 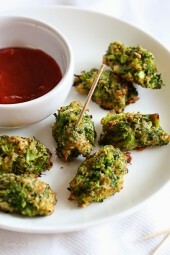 This looks delicious- I love that you used coconut in a savory recipe. This looks wonderful. I have a question for you guys. I have never purchased ginger before. So I'm wondering. 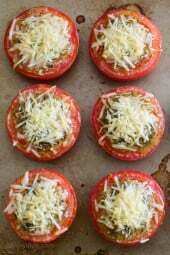 This recipe calls for a minute amount and all that I see in the grocery store is lots; will it keep forever? If not, can I use the powdered ginger? You can freeze fresh ginger in a bag. I made the pork tenderloin with mango salsa last night and my huband, daughter and I loved it. I can't wait to try this. Definitely trying this recipe!!! Thanks for sharing!!! I made the Fiery Pork Tenderloin the other night…FANTASTIC! Can't wait to make the rice too. Thank you, thank you! I have never heard of cilantro before but this looks delicious so will buy some and give it a go! Lori, this is usually how I use up my leftover coconut milk as well. Sorry, I never use a rice cooker, I believe it requires less liquid but not exactly sure how much. Brown rice – I honestly try many brands, Lundberg makes a good short grain brown rice, sometimes I use Carolina for long grain, and I'm not loyal to any brand for jasmine or basmati. The trick is knowing how to cook it, it is trickier than white. I will try to post a simple recipe I've been using soon. Timing could not be better … opened up a can of coconut milk this morning to make some sweet bun dough and was looking for a way to use the remaining milk. I'm excited to try this! Before i read your description I thought this would be perfect with your pork and mango salsa, which I am making tonight or tomorrow night, bought all the ingredients! I can't wait. 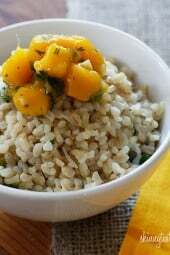 I love, coocnut rice haven't had it in years, I'm going to make this with it!! I'm so excited for dinner! Do you have recommendations on how to do this in a rice cooker? I just recently bought one and am looking for great rice recipes to try in it! This looks yummy. What brands of brown rice do you all use? I can't seem to find a good one. They are either chewy, bland, or overall not good. I would like to start using brown rice more often but I need a good one to win my family over. 🙂 Thanks! I love Texmati brown rice, you can get large tubs at Costco for around 10 bucks. I've made a version of this rice, subbing some lime juice and grated lime zest for the cilantro. Most excellent! Yum! Love any recipe with coconut! Thanks for sharing! This looks really delicious! Brown rice and coconut milk are staples in my house. Looking forward to making this for our next thai dinner. 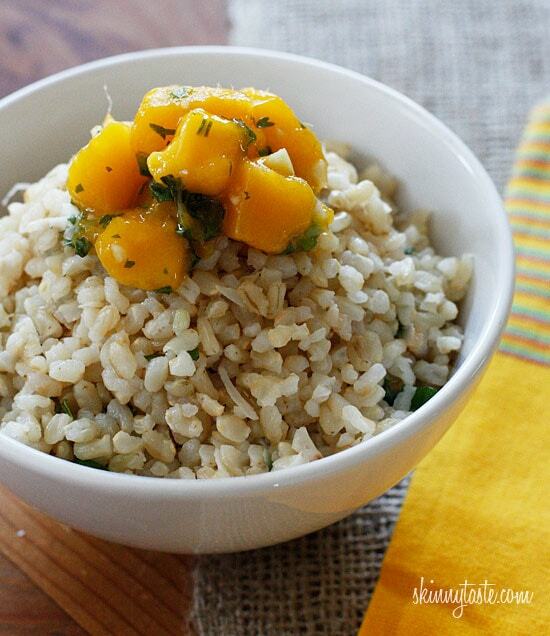 This looks so yummy….I've been wanting a recipe to jazz up normal steamed brown rice!